Be careful who you link to from your hotel website! Some third party channels suggest that hotels link back to them in a reciprocal link exchange and that the hotels will benefit from this. True, there is certainly a benefit. But there is also a cost that may outweigh that benefit. Hotels may consider that displaying a link to well known third parties will make them look good in the eyes of a potential customer. But hotels need to be very careful about who they link to or they may end up damaging their direct business by doing so. The issue relates to what the search engines think, not what the online customer thinks. Links between websites are important not just for the convenience of users but because they allow search engines such as Google to determine the relative importance of websites for users. There are two kinds of links to consider - inward links that link to your website, and outward links from your website to another site. When inward links are matched with outward links between sites, you have reciprocal linking. However the benefit may not be evenly balanced in reciprocal linking. PageRank (or PR) is Google’s numerical value of how important a web page is and therefore its search results positioning. PageRank is calculated for a site by looking at the quantity and quality of all inward and outward links. The actual way that Google determines relative importance, and therefore position in the search results, is complex. But for the purposes of this article we will take a simplified view and think of every link you make to another site as a vote for that site (though not all votes carry equal weight). If a search engine like Google sees many different sites all linking to a particular site, then that site seems to have a lot of independent votes and therefore seems to be more important, more relevant, than sites that have less incoming links. It begins to win in the search engine results election. Its PageRank is enhanced. If every hotel makes a link to some particular third party site, say a booking channel or a review site, then all those hotels are implicitly voting for that third party site to rise in the search engine results. The third party therefore gathers many small votes together for its single website and significantly enhances its PageRank. But even when it reciprocates links back to the hotels it is spreading the links out across all the different hotel websites, donating just a small share of its vote, or PageRank, back to each individual hotel. 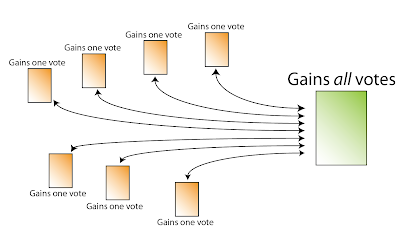 Therefore each hotel is gaining a small slice of PageRank from the third party channel (a small vote), but the third party channel gains all the slices of PageRank from all the hotels (all votes). Even if each of those votes is pretty insignificant, taken together they can add up to a very significant endorsement indeed. The benefit for the third party website in terms of PageRank is therefore far higher than the benefit for each hotel in receiving a reciprocal link. Are You Helping Your Competitor? Whether it is a booking or review site, the third party site is likely to be a competitor of direct business on the hotels’ websites. Hotels are therefore actually enhancing competition for their own sites by linking to such third parties, pushing them up the rankings, and ultimately contributing to diverting more business from their own websites to the third parties. From an online customer perspective, hotels linking off to third parties makes the hotel site less "sticky", in that it presents the online customer with an array of options for booking nearby or similar properties even though your hotel may be quite bookable. It also presents your customer with the convenience of booking through a third party that may already have their details saved from a previous transaction. Either way, you are simply reducing your chances of successful direct bookings. But if the external link is to a third party booker or review site that advertizes booking, then the value of the link to a direct customer of yours is minimal anyway. Reciprocal links are important, but they are best if they are non-competitive. So should you vote? The moral of the story is that you need to be very careful who you give your vote to. Just like democracy, you may think that one vote doesn’t really make a difference. But if everyone votes it can make a very big difference indeed, and how you choose to vote can have significant impact, one that you may regret. Share: Be careful who you link to from your hotel website!